A 20-page guide informs visitors on self-guided tours of the public work. WAILEA, Maui » You might say the 2,600-piece art collection is the crowning touch on a $50 million renovation project recently completed at the Four Seasons Resort Maui at Wailea, but that would be an understatement. Where most properties start with four walls and artwork slapped on as a final thought, the Four Seasons project started with the notion of a fine art collection that would tell the story of Hawaii's art, culture and people from statehood to the present. The rest of the renovations would have to conform to the work. Curator Julie Cline would not have otherwise taken on the job. "I put my foot down," said the head of Julie Cline Fine Arts Services, whose earlier work at the Four Seasons Hualalai on the Big Island raised awareness of the beauty and scarcity of traditional Hawaiian art. Marie McDonald's "Kanaloa," of hand-stamped natural dyes on handmade bark cloth, pays homage to Hawaiian traditions in a modern graphic way. The Punahou alumna, whose work for private collectors and corporations has given her an international reputation, was lured home a second time on a hunch that Hawaii, due to its remote location, might be an overlooked source of contemporary art. She returned to Oahu to tour galleries, talk to curators and meet artists, and became determined to bring them into the mainstream art world. The earlier collection at Hualalai paid homage to ancient Hawaiian art traditions through statehood and caused a frenzy among collectors outside the state, raising the profile of Hawaiian arts long relegated to the realm of craft. "They'd never seen tapa presented in a frame, in a sophisticated manner," Cline said. "After the hotel opened, people went crazy (for the work) when articles came out and guests came to stay." MSD Capital, the investment company owned by computer mogul Michael Dell, wanted the same for its Wailea property, but Cline had other thoughts. "I don't like to repeat myself, but even if I did, I couldn't do it." As a result of the buying frenzy sparked by Hualalai, "Now the art is out of sight, or its availability is limited," she said. "But, I told them, I had a better idea." Julie Cline oversaw the Four Seasons collection, from selection to hands-on installation. WAILEA, Maui » A walk through most hotels a decade ago would have revealed a lot of bad, generic art, but no one was complaining. A hospitality company's first duty, after all, is to tend to the comfort of guests. But after the 300-thread-count sheets, the comfort of a spa, gyms, grand pools and gardens, what could guests possibly want next? Echoing the evolution of humankind, there's no question that when all basic needs are met, the focus turns to intellect and cultural pursuits. Thus, in a first for Hawaii, the Four Seasons Resort Maui at Wailea has transformed its grounds into the equivalent of a museum for contemporary Hawaii art, featuring artists from all the major islands. The centerpiece of the resort's recently completed $50 million renovation is a 2,600-piece museum-quality collection of art displayed throughout the property, including the 380 guest rooms. Curator Julie Cline of Julie Cline Fine Arts Services said that when she first visited the property in 2005, "it had no identity. It could have been a hotel anywhere. I wanted to give it an identity that would connect the hotel to Maui and connect to the people. "I don't just fill wall space," said Cline, who understands hotel owners' reluctance to deal with artwork that might challenge or intimidate guests. She admits scaring the resort's managers by warning, "I'm coming with my Dumpsters. "The art that was here before was non-art. Most of hotel art is faux cardboard art, maybe it's a print out of an art book that they slap into a ready-made frame. "The art I've chosen is subliminally edgy, though it might not seem so on the surface. It's not just putting a pretty picture up, and it's not that classic idea of what you'd expect from Hawaii, like a pretty girl or a pretty sunset," Cline said. "Guests who have seen the work are telling me they're feeling much more personally connected to the work, and I feel this will bring a whole new clientele to this property." 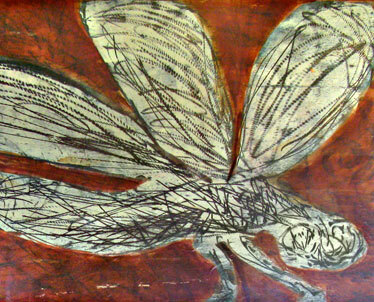 A series of four "Dragonfly" woodcut prints with hand coloring by Paul Mullowney, grace the resort's corridors. The resort's lobby was a natural display area, but no space was overlooked. Works fill halls, elevator landings, guest rooms and the spa, where serenity is expressed through pastels by Margaret Ezekiel and photos by California-based photographer Bobbi Bennett. Even the recreation room, equipped with video games and pingpong, foosball and air hockey tables, is given a splash of color. "This room was very fuddy-duddy, very early '80s. I didn't feel like hanging out here," she told a group of reporters and art professionals on a tour of the premises. The idea of play and fun is now conveyed through art with a surf and aquatic theme. And finding the loo is simplified with Franco Salmoiraghi's photographs of coconut trees fringed in a way that reminded Cline of male and female figures. Far from being upset by their placement, Salmoiraghi, who was on the tour, said he was pleased they were in a place "where everyone has to go." When it was difficult to find suitable pieces for certain areas, Cline commissioned artists to create site-specific work, such as a quartet of guava-branch sculptures by Claudia Johnson depicting "Wave, Water, Moon and Currents" on the fifth and seventh floors of the courtyard grounds. 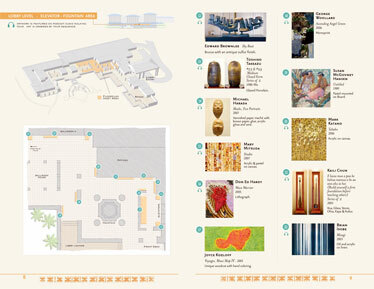 Hotel guests are given a 20-page guide to the public artwork that can be used with an audio tour via podcast or audio players that can be borrowed at the front desk. 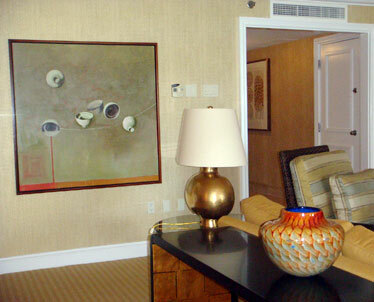 A one-bedroom guest suite at the Four Seasons Resort Maui at Wailea is appointed with Kloe Kang's "Wayfinder" painting and glass vessel by Mike Worcester, with a gold oxide exterior and cobalt interior. Other works in the living area and bedroom are by Madge Tennent, Pegge Hopper and Mika McCann. OF ALL PLACES, it is Las Vegas, a city not generally recognized for taste and refinement, that might have opened hoteliers' eyes to art as an asset and source of differentiation in wooing discerning clientele. A lot of publicity has been generated by Steve Wynn's Picassos at the Bellagio and the Guggenheim Hermitage Museum in the Venetian. But Cline isn't interested in the Vegas version of art as spectacle, viewing it instead as a vehicle for telling the intimate story of a particular place. For nearly three decades she has assembled and overseen collections for private and corporate owners around the world. She isn't surprised that luxury properties would start embracing art. "Because what is the highest prize? When you go back to the Medicis, the Pope and Vatican City, they surrounded themselves with beauty," Cline said. MSD Capital, owner of the Four Seasons Resort Maui at Wailea, wanted her to duplicate the work she had done at Four Seasons Hualalai, which showcased art of and related to Hawaii from 1778 through 1959. 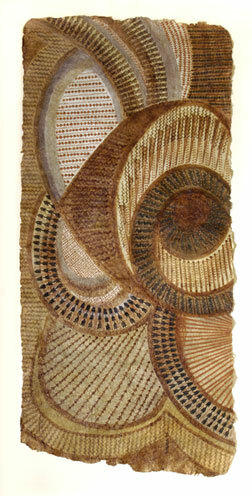 The collection included bark cloth and makaloa mats, as well as paintings by Western artists who visited Hawaii in the 19th century. "When I was working on Hualalai, I felt I was just touching the tip of the iceberg. I went home with piles of information and photographs on contemporary Hawaii artists, not knowing how I was going to be able to share it, although I was determined to showcase this fine-art world." One of Claudia Johnson's site-specific sculptures depicting nature's elements. CLINE IS accustomed to dealing with the biggest names in contemporary art. One of her recent projects involved the Azzura, a Marina Del Rey condominium that incorporates work by some of most important artists of the past 50 years, who had worked in the area, including Jasper Johns, Roy Lichtenstein, Robert Rauschenberg and David Hockney. "I've dealt with major artists and collections, and there's definitely a stigma about art from Hawaii," she said, attributing the lack of respect to the peddling of tourist art. "There is great art in Hawaii, but for a long time there weren't any galleries representing these artists because they couldn't make money," she said. "They made money selling flying dolphins or whales or flowers." Although her company is based in Santa Barbara, Calif., Cline grew up in Hawaii with a love of its storytelling traditions. The works at Wailea are bound by the idea of connecting today's creators to past generations in a complex visual origin tale leading to modern Hawaii society. "The more you spend time with this work, the more you get involved with being here," Cline said. She was not only able to get the company to act on top-to-bottom refurbishing to properly showcase the artwork, but also won agreement to bring all the available artists to a media tour last month, allowing them to speak to national press about their work, techniques and inspirations. "Their families came here and absorbed the culture and indigenous native arts, and through the generations, through their eyes, they are reinterpreting all these connections with the land and culture and expressing it in different ways," Cline said. "With some you feel a great sense of anger, a sense of loss, or great respect, the desire to honor everything that has come before." Inside one of the resort suites, Kloe Kang talked about her work "The Wayfinder," featuring rice bowls configured to look like a constellation, connecting them to her family's journey from Korea to Hawaii. "Wayfinding" refers to the ancient Hawaiian voyager's method of navigation. "They used the constellations to find the way home," Kang said. On the Lower Lobby Level, Yvonne Cheng talked about her 1989 batik image of a trio of Hawaiian women, inspired by color, texture and markings on tapa she had seen in the Bishop Museum. 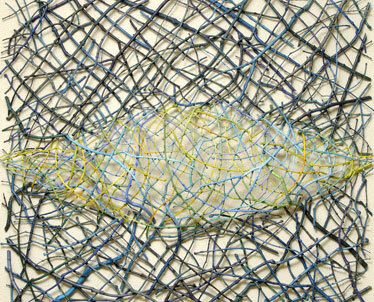 "I fell in love with tapa, but it drove me crazy to capture it in batik," Cheng said of the laborious wax-resist process of layering colors from light to dark, needed to evoke the qualities of tapa. "The designs are so intricate and full of detail," she said. 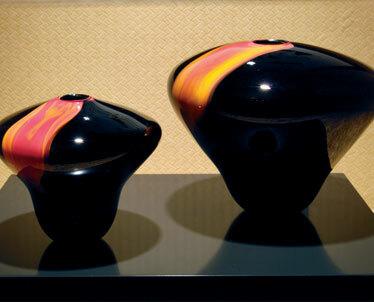 Big Island artist Wilfred Yamasawa's glass vessels capture the flow of lava at Kilauea. PERHAPS THE greatest benefit is the confidence bestowed on the artists whose works have been selected for the showcase. "I think (Cline) did a fabulous job on Maui, including artists that don't usually get tapped by people doing interiors or those getting work into public spaces," said Jay Jensen, chief curator of the Contemporary Museum, who was among those Cline sought for his knowledge about Hawaii's artists. "Up until now, hotel art has been decorative, but now people on Maui will be able to see something different, something more provocative, more interesting and, I think, better," he said. "It will give our artists wider exposure to people coming from all over the world. "Hopefully, this program will encourage other people doing new hotels to install something of higher quality than is usually presented." But with increased viewership comes responsibility. One complaint about Hawaii's art scene is the tendency of local artists to repeat work year after year. Out of the eye of mainstream critics, there has been little incentive to push beyond ideas that have proved to be commercially accepted and popular. Cline said that any artist worth watching must be prepared to step out of his or her comfort zone. "A venue like this gives them the confidence to believe in themselves," she said. "They need to express what they feel and not do what's safe."